Tuesday May 23rd 1899 I was busy taking care of the poultry. I fixed coops and put them out. I sewed a little. Wednesday May 24th 1899 Luther helped me a little about the washing and churned. I finished it and got the dinner. I set more hens in the afternoon. I have more than 50 little ducks. Thursday May 25th 1899 I ironed and Will churned for me. I did baking today. set more hens. put out the little ducks and got things ready to go to town to spend the day tomorrow. Friday May 26th 1899 We had a terrible storm last night. Will brought in the turkeys, ducks and some of the chickens. I put them out this morning and it rained very hard again. John Mc. was up here most of the forenoon I sewed some in the afternoon. 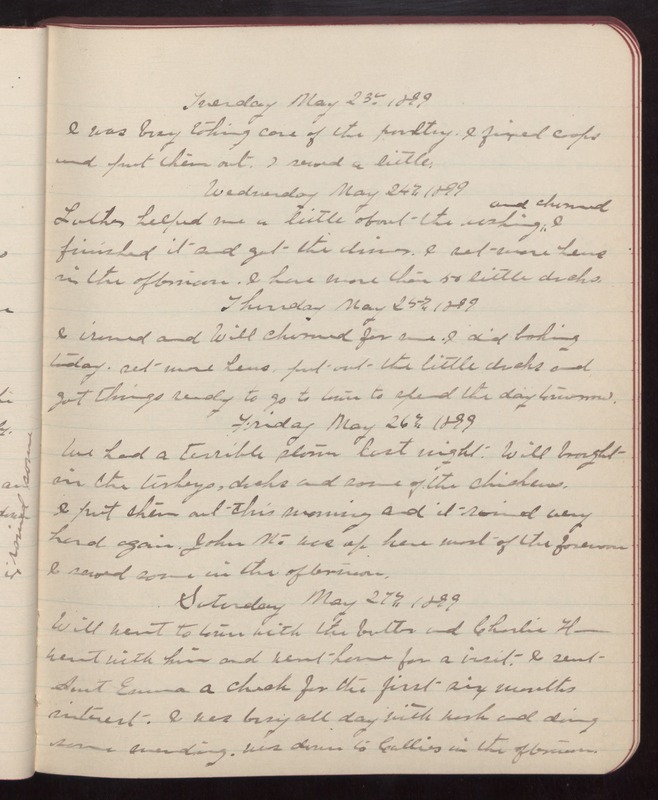 Saturday May 27th 1899 Will went to town with the butter and Charlie H- went with him and went home for a visit. I sent Aunt Emma a check for the first six months interest. I was busy all day with work and doing some mending. was down to Callies in the afternoon.